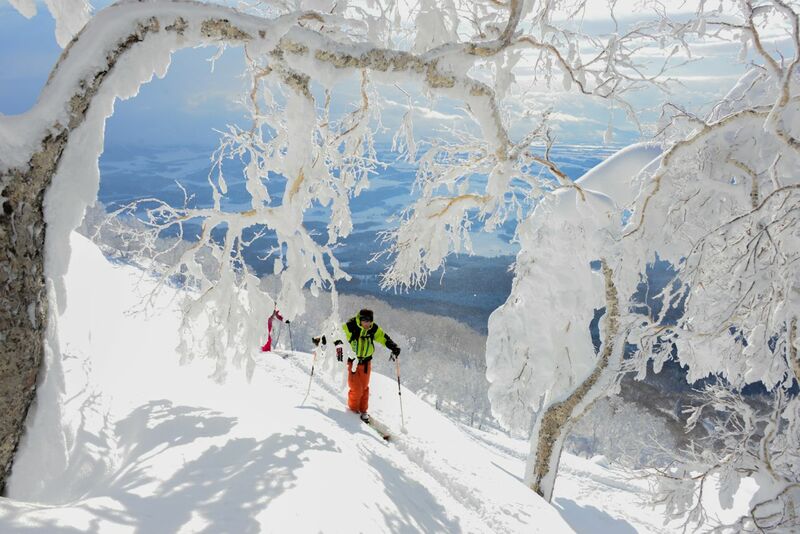 Join Jean, an adventurous IFMGA-certified mountain guide, on the unexplored Hokkaido island. Ski the best powder on Earth and relax in an Onsen in the evening. Japan is a country of traditions, which sees few ski tourers. I invite you to discover the northern part of Hokkaido, the northernmost island in the country, nicknamed the “last frontier”. Although it is more difficult to get there than to other mountain regions in the country, it is undoubtedly worth a visit. The exceptional snow conditions, with a moisture content of less than 5%, makes it the best place for ski touring. We will spend 8 days exploring Rishiri, a volcanic island, and Shiretoko Peninsula, on the easternmost portion of Hokkaido and just a few miles away from Kunashiri, a Russian island. The only requirement is that you love skiing powder, as the snow here is unique. We will also ascend the Higashi-dake volcano. We will be climbing up between 800 and 1,200 meters per day. A good fitness level is necessary. But do not worry, you will be rewarded in the evenings with extraordinary accommodation in different Onsen. You will be able to soak in the natural hot water, at over 104 degrees (F), and relax. They are usually outdoors, with snow all around. 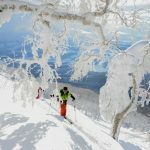 Please contact me if you’d like to join me for an amazing ski tour in Hokkaido. I’ll do my best to provide you a complete, safe and totally unforgettable experience! And if you have a few more days to spend in Japan, you can check out this exciting trip in Hakuba or this unforgettable ski tour on Mount Fuji. Price per person to join a group from 5 to 8 clients. Loan of avalanche rescue equipment (ARVA, shovel, probe) on request. Regular flight to reach the most northerly town on Hokkaido island. Then, by a short transfer by bus, we reach the port of Wakkanai, or we wait for the ferry to cross to Rishiri island. Night in a small onsen in double rooms. Very nice hot springs. We will explore the northern side of the volcano. Night in an onsen in double rooms. We will go on the west face and we will try to cross. We take the ferry back to the village of Abashiri. On the road, a stop in one of the best seafood restaurant of the island imposes itself. Night in an Onsen in double rooms. Ascent of Mount Shari, 1,547 meters, the major mountain of this region. We will pass through Rausu at the end of the road to the Shiretoko Peninsula. Dinner at a ryokan with best seafood in the world (it is almost impossible to eat everything). If the weather is calm and the wind not too strong, we will take a boat to go all the way up the peninsula to try to make the tour of Shiretoko Dake, a unique itinerary. Two possibilities for this day: two magnificent volcanoes not far from Memanbestu, where we will sleep at night. Due to the changing prices of airline tickets, if you register after November 1st. an increase can be applied. The sooner you register, the better our chances will be to book the best Onsen.